June 25, 1993, L. G. Crabo. 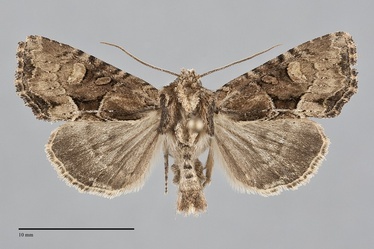 Xylomoia indirecta is a small to medium-sized moth (FW length 12–15 mm) with a mottled brown forewing with a pattern that includes a black bar across the median area and a triangular black patch in the subterminal area, both in the fold, that flies in a variety of habitats during the summer. The forewing is fairly broad and the outer margin has a a slightly scalloped margin in some specimens. The color is mottled light brown, sometimes with a slight olive or red cast, with darker and grayer costa and posterior margin from the base to the postmedial line. An indistinct black bar extends across the median area in the fold. The mid-wing anterior to this bar is often reddish brown, as is the wing base in some specimens. A black triangle abuts the subterminal line in the subterminal area in the fold. The terminal area is dark gray. The basal, antemedial, and postmedial lines are gray with light tan filling, evident as stripes on the costa. The basal lines is absent elsewhere. The antemedial line is distinct posterior to the cell, strongly angled toward the outer margin and incurved above the posterior margin. The median line is dark gray, diffuse on the anterior wing and faint elsewhere. The postmedial line is scalloped often followed by faint dark lines on the veins, faint anterior to CuA2 and more prominent black and pale tan from there to the posterior margin, smoothly arched from the costa to the lower cell, thence angled toward the base to 1A+2A, and bent toward the outer margin near the posterior margin. The subterminal line is pale brown, sinuous with a broad W-mark on M3 and CuA1, preceded by a narrow diffuse gray or brown shade on the costa, opposite the cell, and in the fold near the black triangular spot described above. The terminal line is gray, interrupted at the veins. The fringe is checkered gray and light brown. The orbicular and reniform spots are partially outlined in black with a light tan inner line and are filled with the ground color. The orbicular spot is a long tilted or longitudinal oval or rectangle. The reniform spot is moderately large with black medial and faint gray outer walls, open anteriorly and posteriorly. The claviform spot is black, small and often incomplete. The hindwing is gray-tan with gray suffusion toward the outer margin, with gray small discal spot, veins, and thin terminal line. The hindwing fringe is gray-tan. The head and thorax are tan and red-brown with a thin black transverse line across the distal collar. The tegulae are darker than the central thorax and head, with dark edges. Paired weak tufts are present on the anterior thorax. The male antenna is weakly beaded. 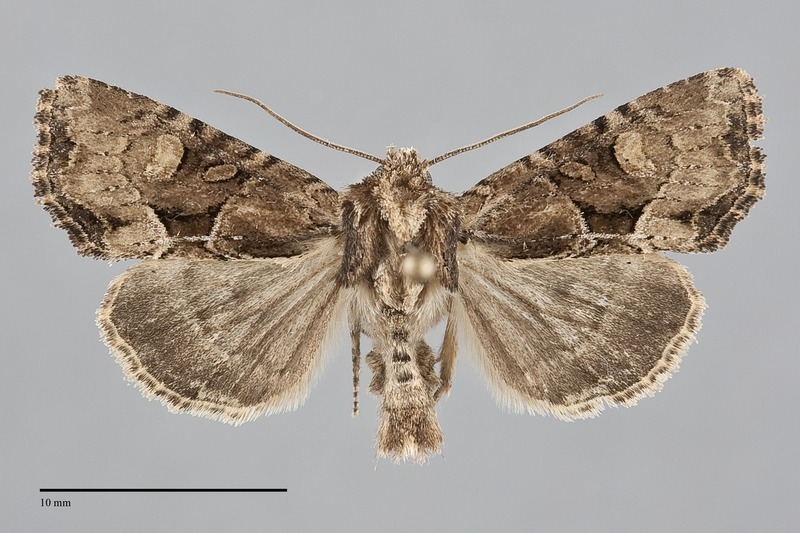 This moth can be identified by its small size, brown color, black median line, and triangular black spot in the lower subterminal area. Lateroligia ophiogramma, an introduced species that is spreading west of the Cascades, is similar but has an extensive dark area on the forewing anterior to the median dash in the fold. Xylomoia indirecta resembles several species of Apamea but is usually smaller and lacks a basal dash, a feature of many Apamea species. Some forms of Apamea indocilis are most like it, but can be distinguished by the basal dash. Apamea vultuosa is also similar and has a similar black mark in the subterminal area but lacks the black median dash that is prominent in X. indirecta. A desert species, Photedes didonea, is similar in size and has a similar pattern. It is paler washed-out gray and orange-tan and lacks the black spot in the subterminal area. Oligia tusa, a species that is restricted to the West Coast, especially ocean beaches, is darker red-brown with pale in the reniform spot, and Mesapamea fractilinea, a widespread but rarely collected moth, also differes in having prominent white in the reniform spot. Xylomoia chagnoni occurs with X. indirecta in southeastern British Columbia. It is less strongly patterned than X. indirecta, is tan without warm brown or red tints, and lacks contrasting dark gray on the terminal forewing. This species is widely distributed throughout much of western North America in moist forest, grassland, and riparian habitats. In the Pacific Northwest, it is particularly abundant in all types of forests and grasslands west of the Cascades. This includes coastal rainforests, mixed hardwood-conifer forests, and oak woodlands. East of the Cascades, it is somewhat more restricted to moist forests, wetlands, and the riparian zone along creeks and rivers. Xylomoia indirecta is widely distributed west and east of the Cascades as far north as Vancouver Island in western British Columbia and to the south-central province further east. The range extends east to the Rocky Mountains in Idaho and western Montana. 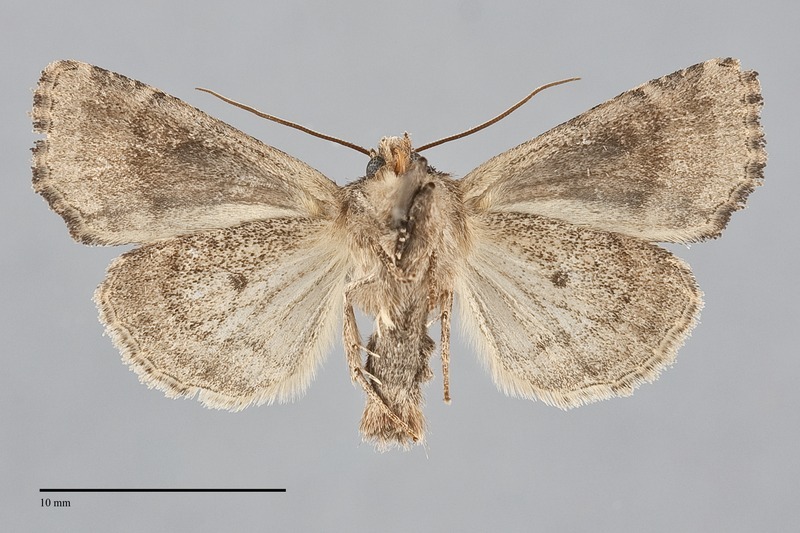 This moth does not occur in dry interior habitats at low elevations but is found in the higher mountain ranges of southeastern Oregon and southern Idaho. The distribution of X. indirecta is centered on the West Coast. It occurs in most of California to near the border with Mexico. There are scattered records from further east in the Great Basin and eastern Arizona. This species is a foodplant specialist that bores into the stems of grasses (Poaceae) and sedges (Cyperaceae). The flight season of this moth extends from mid-June to early September, peaking during July and early August. It is nocturnal and comes to lights.